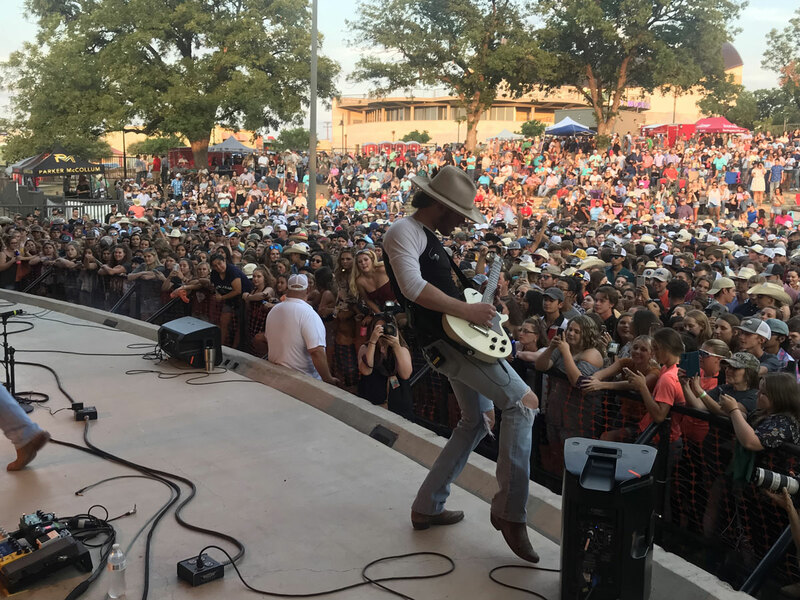 SAN ANGELO, TX—Tucked amongst the live oaks and mesquite trees of the Concho River lies San Angelo’s RiverStage, a concrete amphitheater that has been witness to rise of Texas Country music over the years. 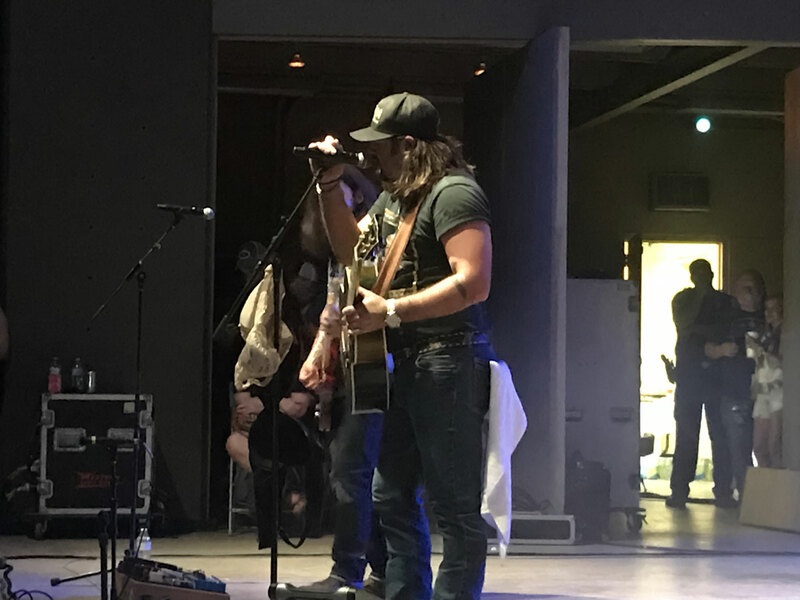 On Friday, Aug. 3, another historical moment was added to the long list of RiverStage history, when three of the newest names in Texas Country; Koe Wetzel, Parker McCollum, and The Read Southall Band, set a new direction of country music in stone, one that takes the genre deeper into the realms of rock’n’roll. Country Music has been a defining facet of Texas culture since the first cowboys and frontiersmen immigrated to the land in the early 1800s. These immigrants came from diverse countries and cultures, including German, Czech, Cajun, Mexican, and American from the Southern U.S. These cultures blended together and so did their music. Spirituals, folk tunes, blues, swings, and polkas all combined to form the earliest iterations of the Texas Country sound. According to the Texas Almanac, regional sounds and techniques arose through this cross-pollination of cultures. Guitarists developed their own style of play, using greater variations of chords and swinging rhythms. The fiddlers in turn, developed longer and slower bow strokes to complement the rhythms of the guitars. These techniques can still be found in today’s Texas Country and Red Dirt music. Two sub-genres that are traditionally defined by where the artist is from, Texas and Oklahoma respectively, but have more recently begun to converge into one overarching sound. For an example of the use of those traditional techniques, look no further than an eastern Oklahoma band, Turnpike Troubadours, affectionately known as simply “Turnpike” by fans. Their hit “Long Hot Summer Day” opens with the familiar draw of the fiddle, setting the tempo for the rest of the band to join in. Later the song perfectly balances the line between the traditional sound and a heavier rock vibe. WATCH Turnpike performing "Long Hot Summer Day"
The music is not the only place that these traditions hold on. The newest generation of Texas Country artists, much like the first generation of traveling Texas Musicians, have developed a tight community. 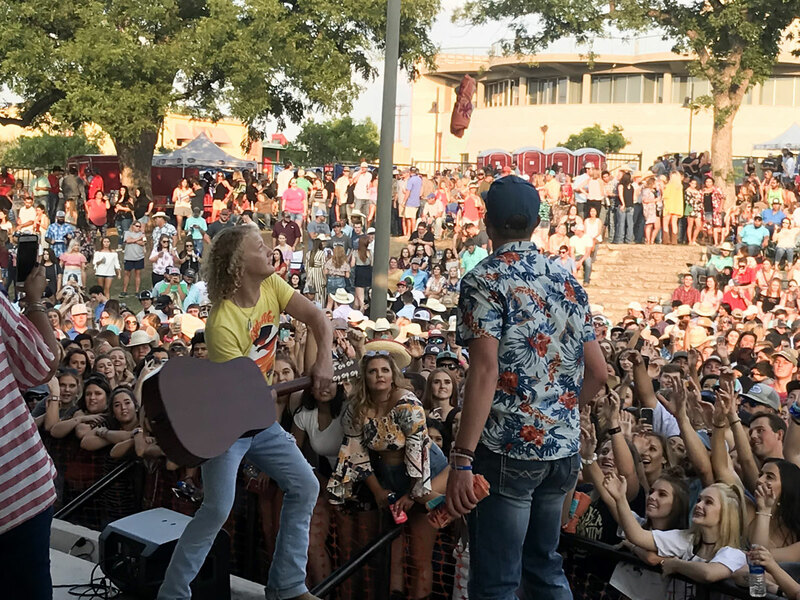 These new artists like Koe Wetzel, Parker McCollum, and Read Southall came together to form unofficial touring families, influencing each other along the way. The informal groups of musicians still form the way they did in the 1800s; over stringed instruments in the corner of a small-town bar. McCollum and his lead guitarist, Brady Beal, a San Angelo native, met just that way. The two became friends that night, and McCollum later invited Beal to open for him. Later, he hired him as his band’s lead guitarist. This sense of community has led to development of diverse styles within Texas Country. Wetzel said his influences include Nirvana, 90s country, and rap, but that he doesn’t have a specific sound he intentionally incorporates into his original songs. From the audience, one can hear the influences of the Seattle Grunge in Wetzel’s music all the way down to the way he uses his lyrics. On the surface, his lyrics might seem comedic, but his words portray images of the simple things in life to explain deep emotions and memories. In one of his most popular songs, “February 28, 2016,” he sings of a drunk night out with friends ending in a Taco Bell run. Underneath the surface this song captures a small moment that most of Wetzel’s target audience of college students can relate to and understand. Those are the feelings of friendship, freedom, and the classic drunk satisfaction of eating too many tacos. Although according to Wetzel, he can’t go to Taco Bell without getting a chicken quesadilla. Inspiration can come from anywhere. Read Southall, front man of the Read Southall Band, cited the Eagles as one of the band’s strongest influences. The 1970s rock band’s seminal album, Hotel California, was released in 1976, nearly 20 years before Southall was born. Even though it may not sound quite like country, fans have shown that they are enjoying this new generation’s take on the classic genre. Less than two years ago, Wetzel was performing to small crowds in local bars. Just last year he was sitting at third billing for a music festival with Cody’s Johnson and Kevin Fowler. Today, Wetzel is headlining an event in the same venue to a crowd that is 2,000 people larger in size than the concert he opened a year ago. Cody Sturm, who owns and operates Blaine’s Pub in San Angelo, and has followed the music scene in Texas closely for decades, said he hasn’t seen such a rise since Pat Green. While music consumption has switched from cassette exchanging to link sharing, the main form of promotion in the Texas Country Music scene is live performances. 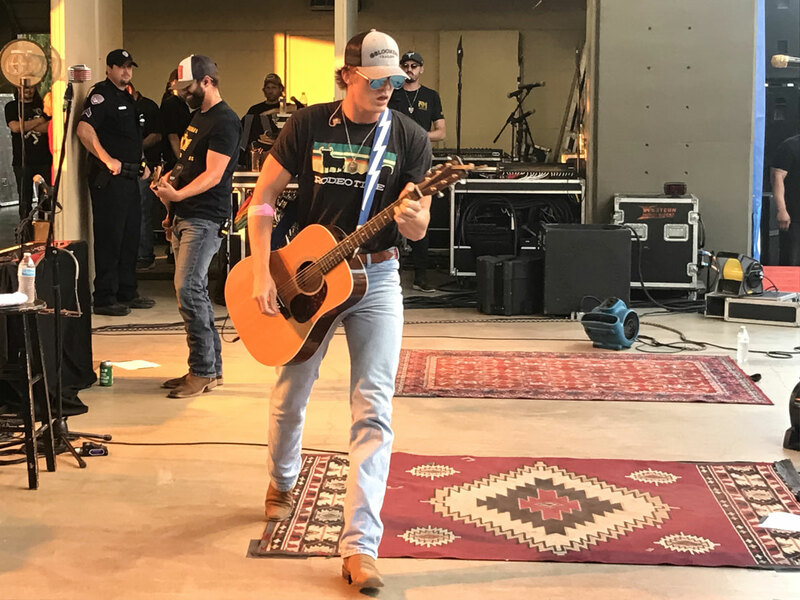 On Friday, Aug. 3, Wetzel, McCollum, and Southall attracted a record crowd at the RiverStage, famous for putting Texas Country Music predecessors like Pat Green and Jack Ingram on the map and on the radio. According to unofficial numbers from the City of San Angelo, more tickets were sold to this concert than any other concert at that venue in the past decade. We could say ever, but no one has official or unofficial crowd counts from the popular Blaine’s Picnic All-day Texas County Music Fest in the 2000s. Our numbers do not include the crowds that gathered on the bridge that overlooks the stage, or the people gathered on the other side of the river. The amount of energy generated by the fans was equally matched by the young artists. Beal had more reason than any of the others to want to put on a good show. No matter if they were born in San Angelo or not, the boys hit the stage ferocity that can only come from someone who is young and ready to prove themselves. This is only the beginning for this new generation of artists. And country music still has much change in store. Courtni is a communications student at the University of Texas at Arlington and a guest writer for San Angelo LIVE! I can see that because country just aint country anymore. It still is in Texas, even if you have to re invent it. I knew some of the old timers and now reflecting , I think some of "yall" do too. especially the Ernest Tubb fans. the famous quote from Carl Smith, was ..
his song was dedicated to his horse. old country stuff. When i was about 1 foot tall, we used to play those albums on our old stereo juke box using vacuum tube technologies.